lablog » Blog Archive » Biennale-Sessions_2018/6-8JUL: Through the scenic body. Mariangela Melato. Without words. Biennale-Sessions_2018/6-8JUL: Through the scenic body. Mariangela Melato. Without words. 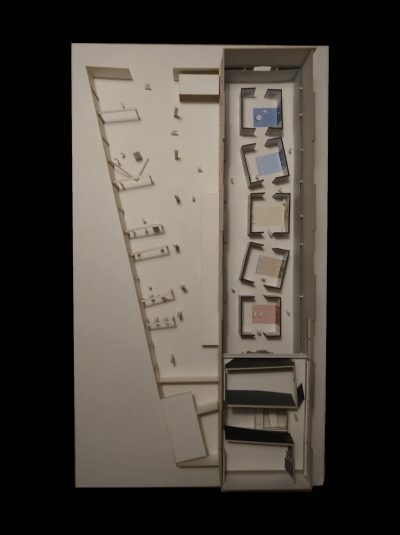 In the “Architecture of interiors design studio” it has been developed an exhibition about the Milanese actress Mariangela Melato, best known for her parts in several Lina Wertmuller’s movies. We decided to show the artist through the non verbal communication, essential aspect for an actor which make her one of a kind. In fact, she transformed a necessary communicative instrument in a device to make her characters and herself unique, able, with gestures and movements, to create parallelism with art history and classical standards of beauty. Working on an abandoned industrial building, we projected a five rooms space trying to tell a story leading nowhere. We aimed to create a word-free history, in which we told five speechless languages: posture, gesture, facial expressions, body movement and look. We gave the visitor the freedom to put the pieces of this puzzle together, thinking about a free and spontaneous itinerary. The exhibition path is generated from the simple curiosity which draws the attention towards what is behind. The rooms are thought as they are nucleuses with a double meaning. One the one hand the actress with her non verbal communication, on the other hand what we culturally recognize as a standard of beauty, to which we give social values and connections with the past history. The itinerary through the boxes intersects with the biographical storytelling of Mariangela Melato’s life and the possibility to play with non verbal communications. Interactive and learning devices are located along the walls of the preexisting building and of the five rooms. The visit ends inside a box we called “through the scenic body”, place where we suppose to recreate the figure of the actress after being known step by step. Her pieces are then collected with her voice which get in there for the first time after a silent visit without words. This entry was posted on Friday, July 6th, 2018 at 2:44 am	and is filed under Biennale of Venice, students' work.